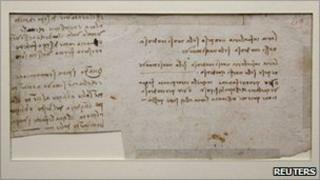 The document was found after a journalist came across a reference to it in a Leonardo biography, the library said. It was among 5,000 manuscripts donated by wealthy collector Pierre-Antoine Labouchere in 1872 and then forgotten. "He was most probably writing in 15th-century Italian, and possibly in other languages," the head of the Nantes library, Agnes Marcetteau said. The fragment of paper with brown scrawls is the second rare item uncovered in the Labouchere collection, after a score by composer Wolfgang Amadeus Mozart was found among the documents in 2008. Leonardo da Vinci (1452-1519) was one of the most important artists and scientists of the Renaissance. His masterpieces include the Mona Lisa painting, which is in the Louvre museum in Paris. He also designed the prototype for a flying machine with a rotating wing similar to today's helicopters.